How did your races go? Who is that guy in the middle? First race back from my time-off/injury...not terrible, but also not very good. Goal was to run competitive and secure a top 5 finish in order to maybe make a Benjamin or two. 15:30s would have been a good time. Start was good and I quickly ducked behind the trail pack. There were two Kenyans up front followed by a young Ezkyas Susay, Michael Pfarr and Orinthal Striggles. Striggles and I battled the hill and did a lot of unnecessary back-and-forthing. When I'd pass him, he'd pass me back, but when I ducked behind our pace slowed. The first mile, at the top of the hill, was a paltry 5:10. I was dumbfounded. I new it would be slow...but this slow? The leaders hit the mile in 5 flat...or just a hair under. I guess the hill was bigger/tougher than I thought. I was still in 5/6th but Striggles soon pulled away from me by mile 2 (10:19 - still slow). Pfarr looked like he might fade and I was gunning after him. The last mile slopes downhill and it must have been my fastest...though I didn't catch anyone. Both guys ahead of me and I ended up making a couple of wide/wrong turns which cost us all a little bit of time. I really hammered the downhill...but didn't get anywhere. Ended up in 6th with a 15:51 (5:04 pace). Not a great time nor effort, but some of the guys ahead of me had run a lot faster in recent weeks and they too were off their usual times. The hill was likely a factor too. Still I wish I had been a bit more competitive and stayed with Striggles...he ended up in 4th. Time to get tougher. 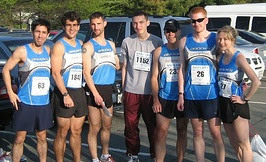 Next Race - Veteran's Day 10K (if not something sooner). No race results to report, just training. I am no longer feeling sore from last weekend but still fatigued. Was only able to do a few easy miles last week. Hopefully I'll be able to gradually build back up this week and next. At that point I'll reassess the racing plan. I watched the Baltimore 5k and Marathon on Saturday. Jake had a strong finish and Julie Culley demolished the competition by over a minute. It was great to see her up there with the guys. I'm not sure what happened to Tebya Naser and Alemgena Desta. They've both run sub 17 5ks this fall but ended up running 18:26 and 19:22, respectively. Maybe another case of pacing issues? My dad somehow managed to PR even though he only runs twice a week (he does the elliptical the other days). I told him not to complain about his times until he runs at least 4 times a week. Jake beat Wardian in April. And he is an olympic qualifier... so it isn't like were losing to some couch potato. I too raced this weekend, and I ran a very slow time for 5k, but I got the impression that the course was long (so did other runners who finished ahead of me)... so much for a test of fitness. I rebounded of this by hitting the track this morning for 3-4x1200 @ 5:20 pace and felt good until the last one, when the wheels started to come off. I definitely need to work on speed for the next few weeks. Luke raced pretty well- I saw the 10k results down on the tidal basin. Good to see his name back! Man Jake I hope when I make my comeback race debut I run in the 15's. That's just sick, way to go. Things are going better for me these days and I should be able to hop into a turkey trot somewhere. Keep training boyz I'm a come'n like a freight train!